f-initials Co., Ltd. specializes in nanotechnology and industrial coatings for a variety of applications and functions. The company has developed a multilayer nanotechnology coating within a box (referred to as the Dream Box) designed for food and medical transport. The coating allows foods like vegetables, fruits and even seafood to stay fresher, longer, as well as contamination-free. It also protects medicines from degrading over time during transportation. Dream Box is a low-cost and environmentally friendly alternative to other transportation methods for food and medical transport. Contamination is a threat to food, especially during transport. The outer coating repels dirt from the surface of the box and the catalytic effect destroys microorganisms, allowing vegetables, fruits and seafood to stay contamination-free for longer periods of time. When transporting food or medicine, especially in hot regions where the temperature climbs out of control, it’s important to have temperature controls without using electricity. That’s just what this coating technology achieves. The outer coating provides protection against infrared sun rays, which prevents temperature increase inside the box. The inner insulation layer also provides extra thermal control. 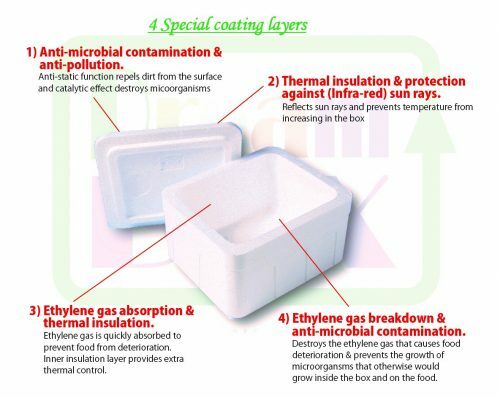 The inner coating quickly absorbs and destroys the ethylene gas responsible for food deterioration, thereby preventing the growth of microorganisms that could proliferate inside the box and on the food itself. This helps to keep vegetables, fruits and seafood fresh for the duration of transportation. In a nutshell, this technology by ef-initials Co., Ltd. allows food and medicines to be kept fresh and cool with no need for electricity over long periods of time. Food (fruits, vegetables, seafood, etc.) is kept fresh for longer periods and free from contamination. This allows consumers access to fresh food, regardless of the distance and time covered from the production area to the consumer. Temperature control (without using electricity) during the transportation of medicine keeps it safe from deterioration. This is an extremely important aspect of the system, especially in hot climates where efficient transportation is not really affordable. There is no competition in the market we know of. Current methods include either using a refrigerator van for transportation or processing the food in specialized factories before transporting it. New users of our system are shifting from the two abovementioned methods to the Dream Box. 1) Layers with minimal thickness are based on cutting-edge nanotechnology. Only a few materials are required to keep the cost low. 2) All the coatings are water-based. There are no solvents. There is no need for a special room in which to apply the coatings. These products are categorized as nondangerous substances, making the exporting and importing costs very low. 3) Only an ordinary foam box is required. Coatings are thin and light to match the advantages of a foam box. 5) There is no need to install electricity to maintain the temperature. The layers are all inorganic, and performance will remain intact unless physical damage occurs to the construction. Since no electricity is required and less energy is used to keep the contents fresh or cool, the emission of greenhouse gases can be reduced dramatically. The example for food transport shows here a definite advantage in the length of cooling time that keeps food fresh. Whereas current systems dramatically “heat up” after 15 hours, our proposed “Dream Box” system “keeps cool” for as long as 48 hours. An antistatic function repels dirt from the surface, and the catalytic effect destroys microorganisms. Ethylene gas is quickly absorbed to prevent food from deteriorating. An inner insulation layer provides extra thermal control. 4) Ethylene gas breakdown and antimicrobial contamination. Destroys the ethylene gas that causes food deterioration, and prevents the growth of microorganisms that otherwise would grow inside the box and on the food. As a result, food is kept fresh and transported for long distances with no need for cooling by electricity. ◆Figure: Current foam box (blue) vs Dream Box (red) for temperature changes. Another popular product on the market now is the photocatalytic antimold film made by Sansinsya Printing Co., Ltd in Japan. This new coated film can be used to make instant clean rooms, allow for safe food packaging, and consequently secure surface and environmental protection in transportation and other various fields, as well. Also, this film is disposable. This means contamination can be tightly controlled. The only problem we can think of is that our coatings might not bind well with the local foam box or its surface. This can be worked out by processing the surface through applying sandpaper or a selected organic solvent, etc. We have three officers handling our international business. Form a cooperation agreement with a local partner in the country where the patent will be issued. This will allow for a gradual transfer of the technologies used and will eventually lead to local manufacturing. The first step will be based on the export of ready-made products, to be followed by maintenance know-how guidance and local production ability.